The use of doilies has decreased, you do not see them resting on as many table tops or vanities as you may have in the past, but that does not mean that their beauty cannot be enjoyed. I have a couple hanging on my wall, I have seen some worked up as window valances, and even pieces together as a jacket, but there are a few other more impressionable ways they can be used. I enjoy how my son has managed to be inspired by crochet and apply it in a different way. He has been playing in pottery and creating bowls and figurines in a local 4H project and one of his vases will leave a lasting crochet impression. Using a small crochet tablecloth he placed an impression in the soft clay before completing his vase. He only used the center to create an almost flower like pattern. 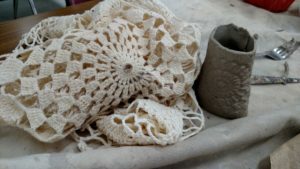 I have seen this done in other ceramic pieces, some artists have used doilies to create various textures in their designs. 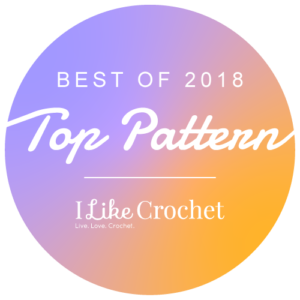 I have even seen pieces that use the doily as the art by encasing it in glass, like a bowl or glass, to highlight the effect of crochet stitches. 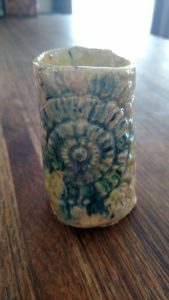 When my son worked the glaze for his vase, he highlight the crochet design a bit more by having the color radiate out from its center. I was surprised he used this approach to his project. He enjoys my crochet, but I never thought that he would incorporate it into any of his crafts. 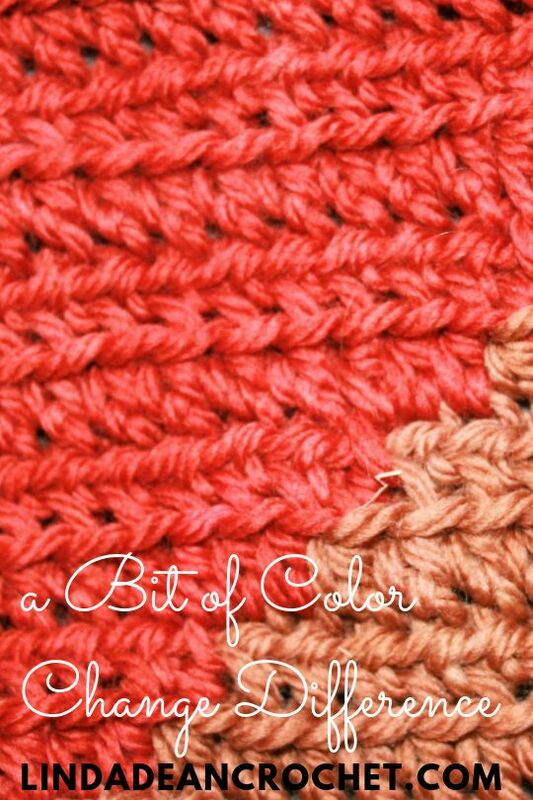 I hope that he attempts a couple of other crochet stitch patterns, and I will admit I have suggested a few. His use of a table cloth has inspired some ideas within my own mind, of how I might be able to incorporate crochet in my metal working class, for instance. 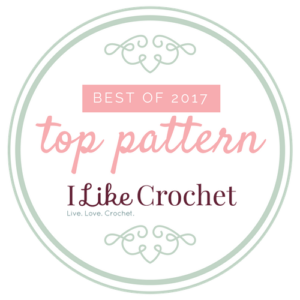 There is a large world of craft and crochet can fit nicely in many different artistic ways. I am not much of an interior decorator. After I have chosen a paint for the walls, it will be that color forever; the furniture has found its placement, it will not move again; why change what took me forever to decide on? I guess this is either I a sign that I am completely set in my ways or too lazy to rework it, either way I am faced with times that I need a bit of different look. It is times like this that I find crochet beanies to be helpful. 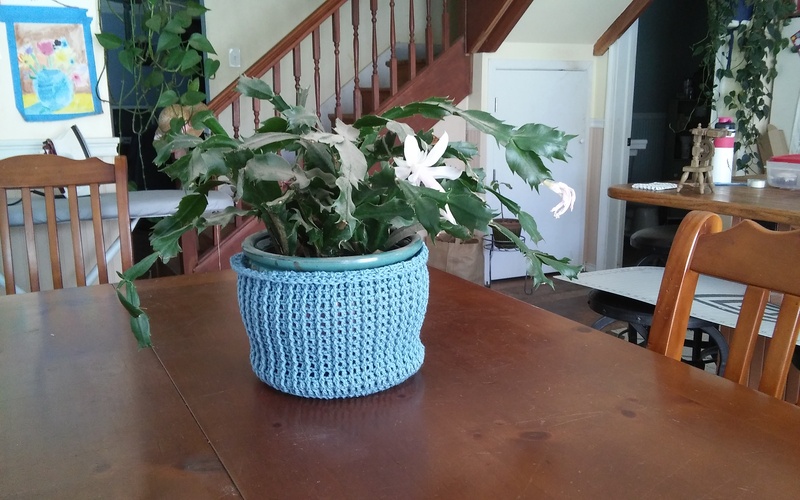 I crochet many beanies throughout the year, many are given to various charities, so I have access to several colors and many textures to change the look and feel of my home décor on a very subtle way. The hats get used as pant cozies. 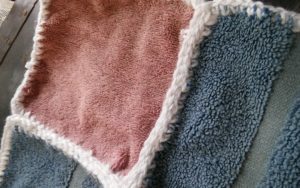 When I was younger I swore I would never create a cozy, after all I don’t mind looking at my toaster or my toilet paper rolls, but somehow I have managed to bring some of it to life in this small way. I have found that really a beanie type hat is essentially a basket turned up side town, so it easily fits the ceramic pots my house plants rest in. I stumbled upon this out of necessity. I found that my pots were scratching my tables, being pottery the bottoms were always a bit rough and my furniture’s finish always seemed a bit soft, the pairing is not ideal. This means that I need something under my pots, perhaps a doily, a table runner, a coaster…yes, these all get utilized too. But for a little different affect, a hat. By placing a beaning over the pot I get to change to color and texture of the pot as well as saving my table surface. SO this is my subtle little visual difference in the house. It would be like putting new pillows on the couch, it gives a little new life. As a side note, I can easily wear the hats again after a wash, so in a sense they just sever double duty now…so far, I don’t think anyone has noticed. It is almost time to admire the spring flowers, almost time to see the final thawing of the ice and snow for the season, a time when the days begin to warm and that restless spirit to be in the sun stirs in us. My home has seen a hint of spring this week. The weather has warmed and the daffodils have begun to bloom. 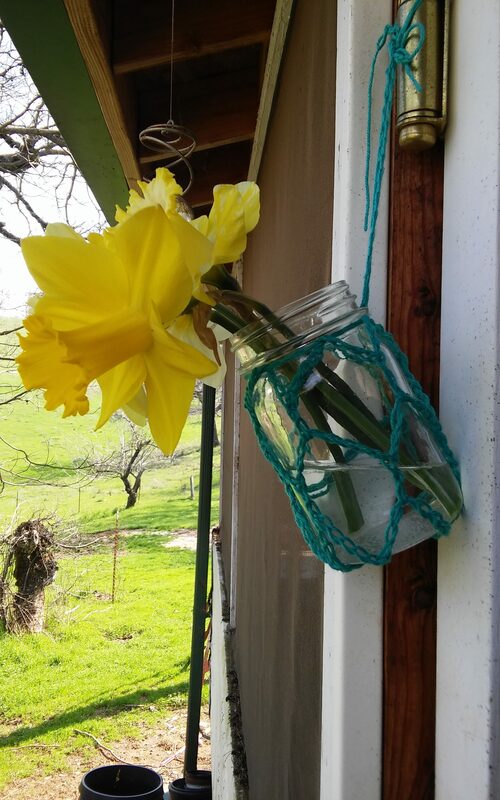 I tend to really enjoy seeing the daffodils, I never think of them as my favorite flowers, but they add such a nice harkening of s seasonal change with a bright yellow (or white) splash in the green hill side out my kitchen window. Daffodils from a hanging “crochet”vase at my door. So I found some scrap of yarn and crocheted an open mesh, for lack of a better term, “bag” that I slipped a mason jar into. This is the perfect for hanging a jar of flowers. My latest jar is hung at the entrance to my screened porch, it is a simple project that adds a definite bright spot in my day. 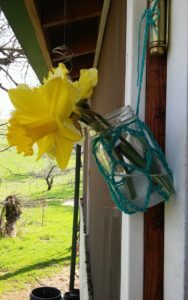 If you would like to attempt this hanging vase yourself, you can begin with a chain circle (creating a loop), then work a double crochet, chain nine and double crochet in the loop again. Work a few of these chain spaces, then begin working in the chain spaces created, making a mesh, until it is as tall as you would like it. 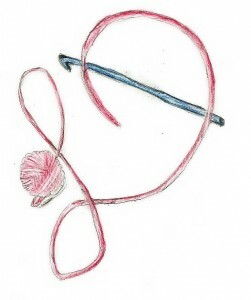 Fasten off the yarn, and then create a length of chain about 12-18” (30-46cm) long. Weave this chain through the last round of chain spaces created and slip in your jar. Tie the chain tightly just under the brim. With the remaining length of chain tie a loop for hanging. It is as simple as that. You could probably create this with just a simple long chain tied under the brim of the jar, however it always makes we a little fearful as I am concerned about the lack of support at the base, so I make this “bag” effect. Either way, I think this is a fun way to bring about spring. It never seems to fail, my kids shoelaces fail at the most inopportune times; when we are just headed out the door to school, when we are off to a new event or sport obligation. 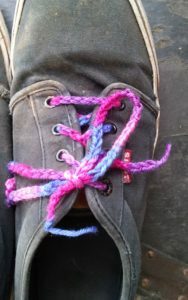 As a result I have had to find some quick fixes and amazingly my kids have come to actually request them now as a fashion statement…I crochet shoelaces. Granted when really looking at the shoes, they have seen better days, but the kids love them and have some that they will wear until they fall apart. I guess I shouldn’t be too surprised, I have a few myself. However dressing them up with a bit of yarn was never my initial intent, it was simply necessity. Yet as my kids get older they have found these bits of yarn helping them to find their own identity. So why crochet a chain, why not just use a strand of yarn? Well the short story is that the chain actually holds better when tying a bow, and is stronger. When using just a stand of yarn, it is held together by the ply. 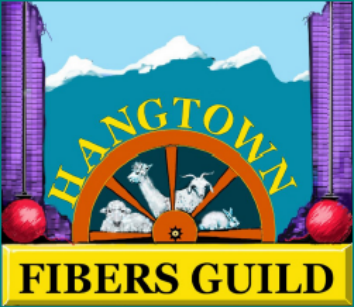 The ply is part of the yarn construction, most yarns are made up of strands that are spun in one direction, then these strands are spun together in the opposite direction, this is the ply. Granted the tension of the ply does create a strong yarn, just not one that is quite strong enough to live up to a shoelace on my kids shoes. 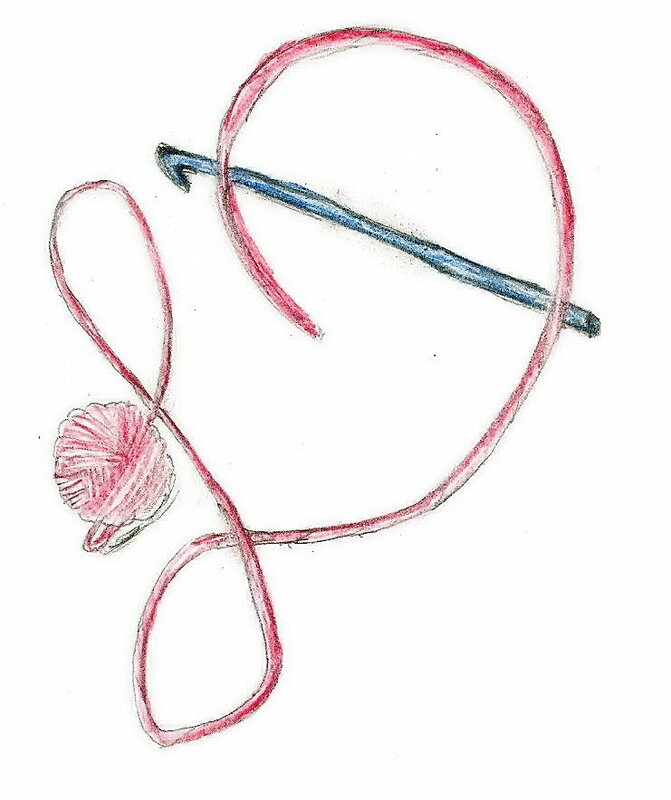 Creating the yarn into a chain, creates three strands instead of just one. 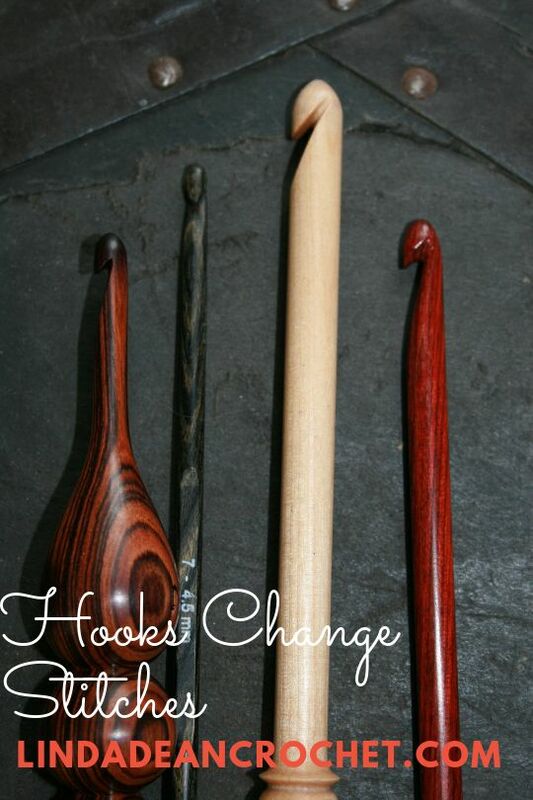 It also makes a little more heft in the diameter, so it is easier to tie and untie. What I find the most interesting is how my kids have fun picking out new colors for the laces. My son even enjoys adding a bright pink to his laces, at least it helps them have some individual style.